The NEO is comprised of precision-machined components and extensive R&D with the goal of creating a lightweight, high performance レギュレータ. Mission Accomplished. 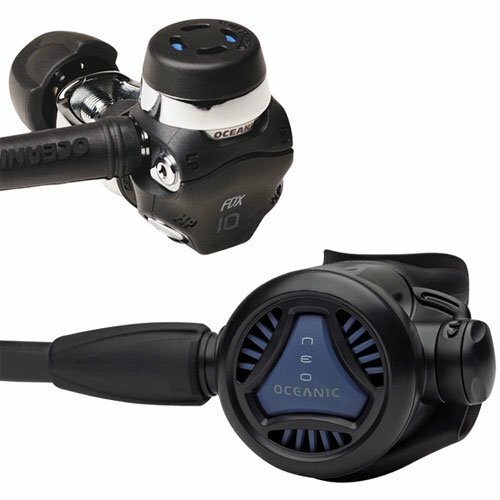 The NEO features effortless pneumatically balanced breathing paired with a compact over-balanced diaphragm first stage. The pneumatically balanced second stage reduces breathing resistance to near zero with a balanced valve seat designed to respond to the slightest inhalation. A pneumatically balanced second stage actually has (or can have) the same initial crack opening effort as a mechanically balanced, but the spring force of a pneumatically balanced second stage is lighter so it's spring rate is also lower. Therefore the force required to open the valve farther as flow increases is less than that required for a mechanically balanced second stage with a higher rate spring. So the total effort to breathe the pneumatically balanced second stage is indeed less. The spring force must be just eno ugh to overcome the difference between downstream air pressure and upstream balance chamber pressure. The downstream air travels through a hole in the poppet into the balance chamber and applies an "upstream" force just slightly less than the downstream force. Ergonomic A.V.S. (Adjustable Venturi System) Dive/Pre-Dive Switch designed to be unobtrusive, yet easily manipulated even with the thickest gloves, the A.V.S. deflector vane found in the NEO either diverts airflow from the v alve to the mouthpiece, producing effortless venturi-assisted inhalation or creates enough resistance to prevent free flow on the surface. The NEO was designed using the latest 3-D computer modeling techniques. This allows us the ability to model and test performance while still in the early stages of development. The NEO's unique valve, deflector vane and housing design direct airflow from the valve directly to the mouthpiece, producing nearly effortless venturi-assisted inhalation. FDX-10 Balanced Diaphragm First Stage Forged from marine-grade brass, the FDX-10 features optimized air paths and angled hose ports for superior performance and comfort. A sealed Balanced Diaphragm design, Enviro Kit and patented DRT TM (Dry レギュレータ Technology) isolate all internal components from the environment. 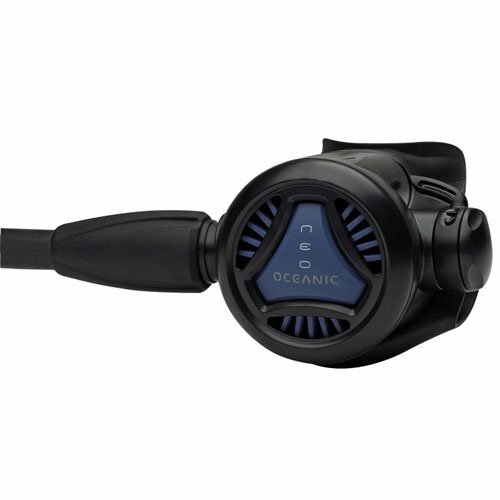 2 high pressure and 4 low pressure ports allow convenient and comfortable hose routing.